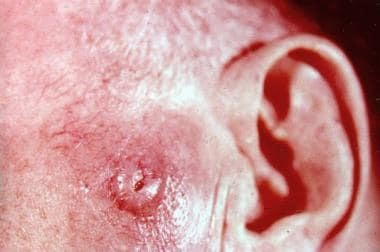 Atypical fibroxanthoma (AFX) is a tumor that occurs primarily in older individuals after the skin of the head and neck has been damaged significantly by sun exposure and/or therapeutic radiation. Clinically, lesions usually are suggestive of malignancy because they arise rapidly (over just a few weeks or months) in skin in which other skin cancers have been found and treated. When this clinical impression is combined with highly anaplastic pathology, misdiagnosis can result in unnecessary and extensive surgery and radiation. The image below demonstrates the typical clinical presentation of an atypical fibroxanthoma. Red, beefy, sessile nodule typical of clinical presentation of atypical fibroxanthoma. Note the markedly sun-damaged skin with solar telangiectasias. Courtesy of Capt James Steger, MC, USN, US Naval Hospital, San Diego. Histologically, lesions show a highly atypical and pleomorphic cellular appearance, but they typically respond to simple excision. Clinicopathologic correlation is essential. Factors important to consider are lesion location, patient age, histopathologic appearance, and the observation that the tumor arises from the dermis, not the fat. Many AFX tumors may represent a superficial form of malignant fibrous histiocytoma (MFH) with a much better prognosis. Some cases may represent primary squamous cell carcinoma (SCC) that fails to express keratin. Sun exposure and/or therapeutic radiation that have caused significant skin damage are associated with the development of atypical fibroxanthoma (AFX). The tumor primarily occurs on the head or neck of older individuals. In one study, age ranged from 13-95 years with a mean age of 69 years. Hussein MR. Atypical fibroxanthoma: new insights. Expert Rev Anticancer Ther. 2014 Sep. 14(9):1075-88. [Medline]. Diaz-Cascajo C, Borghi S, Bonczkowitz M. Pigmented atypical fibroxanthoma. Histopathology. 1998 Dec. 33(6):537-41. [Medline]. Requena L, Sangueza OP, Sanchez Yus E, Furio V. Clear-cell atypical fibroxanthoma: an uncommon histopathologic variant of atypical fibroxanthoma. J Cutan Pathol. 1997 Mar. 24(3):176-82. [Medline]. Bedir R, Agirbas S, Sehitoglu I, Yurdakul C, Elmas O. Clear cell atypical fibroxantoma: a rare variant of atypical fibroxanthoma and review of the literature. J Clin Diagn Res. 2014 Jun. 8(6):FD09-11. [Medline]. [Full Text]. Nemejcová K, Dundr P. Granular cell variant of atypical fibroxanthoma. A case report. Cesk Patol. 2014 Winter. 50(1):34-37. [Medline]. Rudisaile SN, Hurt MA, Santa Cruz DJ. Granular cell atypical fibroxanthoma. J Cutan Pathol. 2005 Apr. 32(4):314-7. [Medline]. Starink TH, Hausman R, Van Delden L, Neering H. Atypical fibroxanthoma of the skin. Presentation of 5 cases and a review of the literature. Br J Dermatol. 1977 Aug. 97(2):167-77. [Medline]. Singh M, Mann R, Ilankovan V, Hussein K, D'arrigo C. Atypical Fibroxanthoma-A Retrospective Immunohistochemical Study of 42 Cases. J Oral Maxillofac Surg. 2012 Apr 9. [Medline]. Michie BA, Reid RP, Fallowfield ME. Aneuploidy in atypical fibroxanthoma: DNA content quantification of 10 cases by image analysis. J Cutan Pathol. 1994 Oct. 21(5):404-7. [Medline]. Worrell JT, Ansari MQ, Ansari SJ, Cockerell CJ. Atypical fibroxanthoma: DNA ploidy analysis of 14 cases with possible histogenetic implications. J Cutan Pathol. 1993 Jun. 20(3):211-5. [Medline]. Bugatti L, Filosa G. Dermatoscopic features of cutaneous atypical fibroxanthoma: three cases. Clin Exp Dermatol. 2009 Dec. 34(8):e898-900. [Medline]. Calonje E, Wadden C, Wilson-Jones E, Fletcher CD. Spindle-cell non-pleomorphic atypical fibroxanthoma: analysis of a series and delineation of a distinctive variant. Histopathology. 1993 Mar. 22(3):247-54. [Medline]. Giuffrida TJ, Kligora CJ, Goldstein GD. Localized cutaneous metastases from an atypical fibroxanthoma. Dermatol Surg. 2004 Dec. 30(12 Pt 2):1561-4. [Medline]. Grosso M, Lentini M, Carrozza G, Catalano A. Metastatic atypical fibroxanthoma of skin. Pathol Res Pract. 1987 Jun. 182(3):443-7. [Medline]. Polcz MM, Sebaratnam DF, Fernández-Peñas P. Atypical fibroxanthoma management: Recurrence, metastasis and disease-specific death. Australas J Dermatol. 2017 Aug 17. [Medline]. Zalla MJ, Randle HW, Brodland DG, et al. Mohs surgery vs wide excision for atypical fibroxanthoma: follow-up. Dermatol Surg. 1997 Dec. 23(12):1223-4. [Medline]. Ang GC, Roenigk RK, Otley CC, Kim Phillips P, Weaver AL. More than 2 decades of treating atypical fibroxanthoma at mayo clinic: what have we learned from 91 patients?. Dermatol Surg. 2009 May. 35(5):765-72. [Medline]. Fish FS. Soft tissue sarcomas in dermatology. Dermatol Surg. 1996 Mar. 22(3):268-73. [Medline]. Microscopic view of atypical fibroxanthoma. Note the large abnormal-appearing cells in a field of spindle cells. Courtesy of Capt James Steger, MC, USN, US Naval Hospital, San Diego.